The other night I was in need of a quick dinner option that would use what I already had in the fridge/cupboard and save a trip to the shops. Taste.com.au came up with this answer and having never before made Carbonara properly, that is, traditionally – I decided to give it a go. The whole family chowed down on this dinner and asked for more. This yummy ‘sometimes’ dinner would be an easy end to a day gone wrong or a simple, achievable meal for a large group. Total cost $3 and serves 6+. Enjoy! 1. Cook pasta in a large saucepan of boiling salted water for 8 minutes or until al dente. Drain, reserving 125ml (1/2 cup) cooking water. 2. Meanwhile, heat oil in a large, deep frying pan over medium heat. Add garlic and pancetta, and cook, stirring, for 6 minutes or until both are light golden. Discard garlic and remove pan from heat. 3. Whisk eggs, parmesan and 1 tsp freshly ground black pepper in a bowl (don’t add salt as cooking water and pancetta are salty). Add reserved hot cooking water and whisk until well combined. 4. Return frying pan to medium heat. Working quickly, add hot pasta and toss for 2 minutes or until well coated with oil and pancetta. Remove pan from heat, add egg mixture, then toss for 1 minute or until egg mixture is creamy and warmed through (the heat from the pasta and pan will cook and slightly thicken the egg mixture without scrambling it). 5. 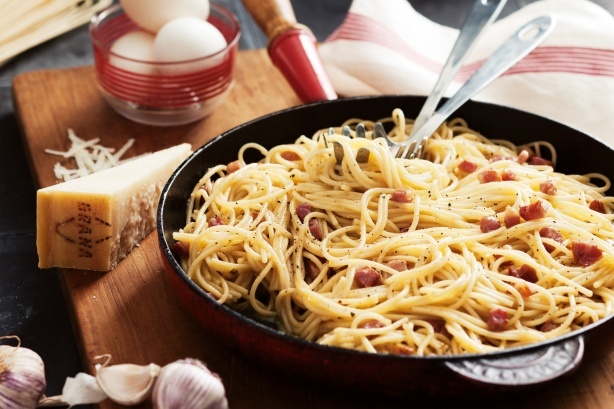 Divide carbonara among plates and scatter with extra parmesan. Serve immediately.